Distinctive features: Shrub; This shrub has distinctive red bark and usually grows in wet areas. Twigs have white pith.  Silky Dogwood (Cornus obliqua) - has striped bark.  Round-leaved Dogwood (Cornus rugosa) - has large round leaves.  Alternate-leaved Dogwood (Cornus alternifolia) - has alternate leaves.  Flowering Dogwood (Cornus florida) - has showy white flowers with large petals (actually sepals). Leaves: Opposite/Whorled, Simple, Entire; Opposite, simple. Habitat: Fields and Open Areas, Wet Areas; Open wetlands, damp woods. Photographs: 123 photographs available, of which 8 are featured on this page. SCROLL DOWN FOR PHOTOGRAPHS. A Red Osier Dogwood thicket in late fall. Like most dogwoods, it has opposite leaves and branches. Note the distinctive shiny red bark. Near the ground it tends to be more green. The coloration appears to be dependent on whether the sun shines on the bark. Where shaded, it is green. In the sun, it is red. 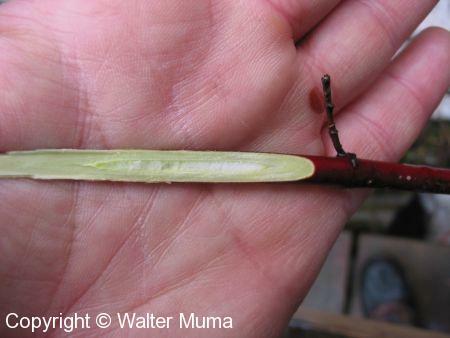 The pith of Red Osier Dogwood is white. (The pith of the very similar Silky Dogwood (Cornus obliqua) is brown). Ripening fruit in the fall. 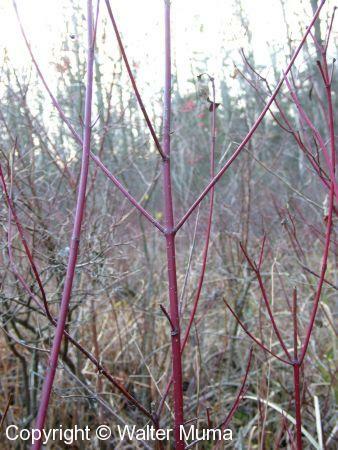 Red Osier Dogwood is very good for making baskets, as it bends easily without readily breaking. For more information about this, please visit the Wildwood Survival website, containers section.